One facet of Senator Robert F. Kennedy's assassination surrounds a female that members of the public have sought over fifty years, and officials have sought to dispel. Yet the story is not as simple or as definitive as some claim on both sides of the debate. This historical argument has rendered a convoluted, sometimes verifiable, and speculative patchwork over the years. Some claim there was only a single nefarious female responsible for everything suspicious occasion cited but others claim it all was just an unreliable witness hoax, yet substantial evidence does not fully support either proposition. The allegations reportedly began with the statements of eyewitness Sandra Serrano who claimed a couple ran by her on a stairway outside the Ambassador Hotel and yelled "We shot him" as they fled the scene. Witness Vincent DiPierro originally confirmed Serrano's claims of a female in a white dress with black polka dots being present at the crime scene and possibly interacting with Sirhan Sirhan. Los Angeles Police Sergeant Paul Sharaga additionally claimed that local witnesses spotted an unidentified couple running and shouting, "We shot him". The report filed by Sergeant Sharaga would vanish and he would publicly dispute a later offered summary. Subsequently, both Serrano and DiPierro would change and recant their original claims due to official pressures, inconsistent aspects of their statements, and the desire of the Los Angeles Police to label the claims a hoax and declare they had no foundation in evidence. Serrano presents a public witness supporting conspiracy that officials and critics use attempting to discredit all related allegations of conspiracy relying on evidence. DiPierro recanted but later supports official declarations to explain his troublesome earlier description of the unknown female. However, several witnesses unconnected with Serrano or DiPierro consistently observe multiple females that fit portions or several traits of the unknown female. Complied for your review is evidence with a list of several candidates for comparison to the official and public allegations. Sharon Rothschild: She is among the largely unknown and unlikely possibilities in the case quietly suggested by officials before they chose to deem most allegations of a polka dot dressed female as being a hoax. Rothschild was a Caucasian female, 22, 5'4, 120 lbs, had red hair wrapped in a white scarf, blue-green eyes, and wore a dark brown dress covered in white polka dots. Officials cite her as being a possibility because of her polka dot dress but her varying physical characteristics, dress colors, and location do not support the description most witnesses offered. actions did influence some witness statements. 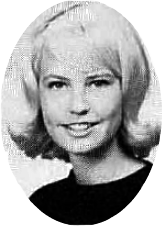 Lucille Fried aka Lucy Cloyd: Fried was a reported member of the Southern California District Communist Party and one informant told officials she was a polka dot dress candidate. Officials depict her as Caucasian, 26, 5'2, 120 lbs, with blue eyes and Fried likely was considered due to her reported Communist ties and official interest in Sirhan possibly being linked to them via this woman. Yet there is no substantial testimony or evidence she was present at the crime scene and lacking this no reason to believe she is the unknown female sought. Robin Casden: The youngest of the possible identified candidates offered in the hotel pantry during the attack on Senator Kennedy is Robin Casden. Official reports offer that she is 16, Caucasian, 5'3, 120 lbs, has long brown hair in a ponytail with a white bow, and sported a white dress with white floral embroidery. After the shooting ceased, she had several spots of blood on her dress and was hysterical according to her interview. Multiple witnesses inform officials as she ran from the pantry to the ballroom Casden yelled, "We shot him". Kris Sumpter: She was an employee of the Ambassador Hotel that was ascending a stairway connected to the Embassy Ballroom when the shots were fired. Sumpter was noted by officials to have been a possible candidate for the unidentified female in a polka dot dress and is described as 21, 5'1, 150 lbs, brown eyes and hair, wearing a white blouse with small black polka dots and a black skirt. While her blouse was quite similar to the unknown female, her physical characteristics do not match the most cited female and Sumpter's location would preclude being observed in the hotel pantry during the attack. near Sirhan during the gunfire. While outstanding questions and claims remain, the evidence suggests multiple prior critics and proponents of conspiracy have presumed much without offering substantial evidence. If we account for possible other future candidates still undiscovered in the primary documents, the chaotic and hysterical crowds, the public speculations, and the desire of officials to discredit all mention of conspiracy, the facts are not as clear as some imagine. To determine eventually who this unknown female ultimately was shall require verification based on the facts and not merely largely speculative claims offered by some advocates and officials.